The Caterham 160 is the definitive fun machine. It’s the perfect weekend car when trivial matters like the lack of proper doors, windows and a roof pale into insignificance when the prospect of a summer morning blast down your local B-road lies before you. Amazingly, the speed can also be complemented by excellent fuel consumption. The entry-level Caterham makes do with a Suzuki-sourced, 660cc turbocharged 3-cylinder engine which produces just 80 bhp and 79 lb. ft. of torque. However in a car that weighs about as much as your shoes, this is plenty. As well as actually being fast, the Caterham feels even quicker than it is thanks to the tremendous sense of speed generated from being so close to the ground and having so little bodywork. Practicality is clearly not a strong point, with just two seats and very little space to put anything, but that is missing the point somewhat. The same is true for refinement. It’s hard to think of a car that is less refined with wind, road and engine noise aplenty. Some people do use Caterhams every day, but you need to be very committed. 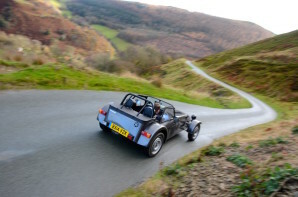 Once into its favourite habitat, the B-road, the Caterham excels. The steering is razor-sharp and offers masses of feedback. You sit just in front of the rear wheels and very close to the floor which gives a great sense of what’s going on. Driving a Caterham quickly demands concentration but gives more back than practically anything else. Thanks to its amazingly low weight and its direct steering, the Caterham has a very good shout for the title of best handling car in the world. Given it costs less than an MX-5 it’s an absolute bargain, although you’re also likely to need another car for the more practical requirements of life.